« ISBW11 Day Two: Photos from the conference. ISBW11 Day Two: Rising to the challenge – a quick chat with Mike Fortes. 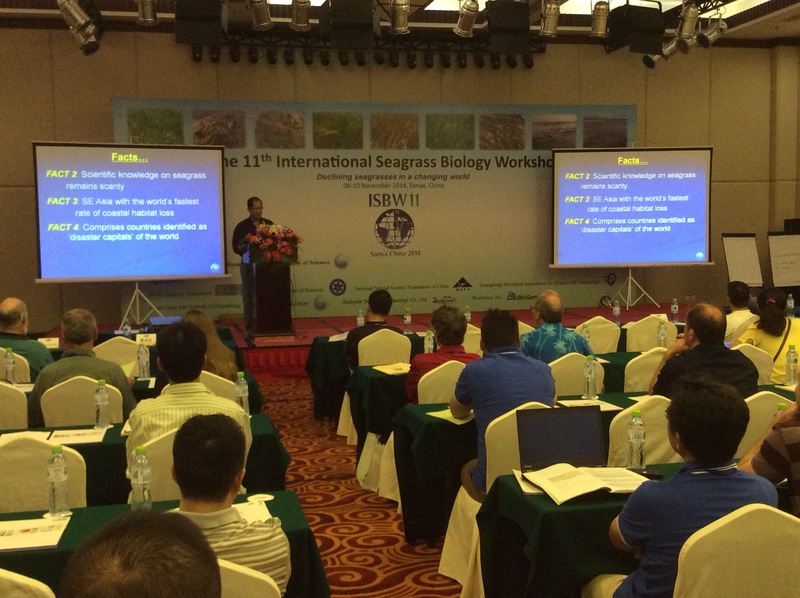 Day two of the 11th International Seagrass Biology Workshop opened with Mike Fortes issuing a challenge to seagrass scientists to lead the charge on raising awareness on seagrass habitats in the morning’s plenary. Mike believes that there is still much work to be done on seagrass science and management in the tropics and especially in the South-East Asian region where coastal habitats are highly threatened by pressures of population growth, urbanization and coastal development. Q (Siti): There are obviously a lot of gaps in our knowledge of tropical seagrass ecosystems in the Indo-Pacific. What do you think are the three most pressing issues that need to be addressed as soon as possible? A (Mike Fortes): The three challenges I have in mind are related and inter-connected and it’s difficult to separate them, but firstly there has to be a solid scientific base (e.g. baseline knowledge) to work with in SE Asia, which is lacking. Secondly, there is a lack of understanding of science and that needs to be understood by managers and stockholders. As scientists we need to be involved in the communication of our work. And thirdly, all this knowledge and understanding needs to be translated into policy. Science needs to form the basis for management and policy decisions. Q: Do you think a different approach is needed for outreach and communication to raise awareness of seagrass habitats and science communication in the South-East Asian region compared to other regions in the world? A: In general it’s not that a different approach is needed, but that a serious and affective approach is required. By affective I mean that our outreach efforts have to affect or touch people at a deeper level – what we communicate has to resound with those we are trying to communicate with. Q: What’s your take on the state of seagrass science in the region and what do you think we should aim for? A: We need to address the issues at root of the problem. Sometimes the most pressing issues have solutions that are right in front of us but require an approach that is out of the “science toolbox”. For example if there’s discharge affecting water quality and subsequently seagrass in an area, the most direct solution is to first stop the discharge and sometimes this requires us talking to politicians and decision makers first before we apply a solution based on our science and knowledge of seagrass habitats. Thanks Mike for sharing your thoughts!